EUROZONE (AUS) (Chestnut 2010-Stud 2014). 4 wins-2 at 2-from 1100m to 1500m, A$476,080, ATC Stan Fox S., Gr.2, Rosebud H., L, Australian Turf Club 2YO H., 2d MRC CF Orr S., Gr.1, 3d ATC Randwick Guineas, Gr.1, 4th VRC Australian Guineas, Gr.1. Half-brother to SW Miss Marielle (STC Hill S., Gr.2). Out of SW Miss Vandal (WATC Sires’ Produce S., Gr.3). Sire of the placegetters Eurogem, Euroglider, Eurosay, Krone, The Euro, etc. His oldest progeny are 2YOs. STRAT'S FLYER (g. by Strategic). 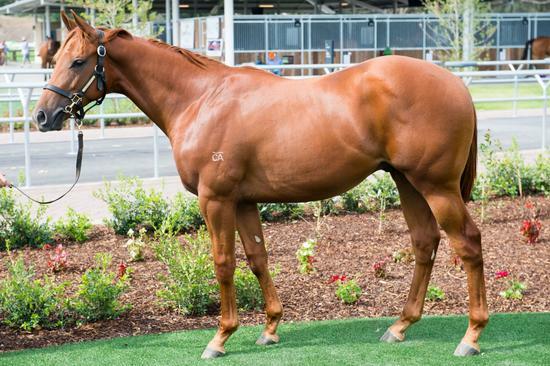 8 wins from 1000m to 1600m, A$565,900, Gosford RC Takeover Target S., L, STC Winter S., L, QTC Quantum Strawberry Road Quality H., STC Winter Championship H., AJC Skilled Safety H., Randwick Betting Auditorium H., STC Red Rock Deli H., 2d AJC Tramway H., Gr.3, Go for Gold Welter H., STC PCS Australia NEC H., Kidney.org.au H., Mortgage Professionals 2YO H., Escape to the Races 2YO H., Freeway Republic Beer Welter H., AJC PFK H., Cabra-Vale Diggers Club Capers 45th Birthday H., STC Nivea Visage H., 3d STC Shannon S., Gr.2, AJC Narellan Gardens 2YO H., Fat Quaddies H., STC JW Mailing Services H., 4th Newcastle JC Newmarket H., Gr.3. BAUBLE (f. by Hurricane Sky). Winner at 1600m, A$103,300, MVRC Alexandra S., L, 2d MRC Sportingbet H., SAJC Williams Refrigeration & Air Conditioning 2YO H., MVRC Members Equity Bank P., 4th AJC Adrian Knox S., Gr.3. Admission (f. by Bernardini). 2 wins at 1200m, 1400m to 2016-17, 3d ATC TAB Highway H.
Belmond Express (g. by Sebring). Placed in 2017-18 in Aust. Baboosh (f. by Arena). Placed at 2 in Aust. Zedrum. 2 wins-1 at 2-at 1300m, AJC Bankstown Club 2YO H., Sydney's Best H., 3d AJC Dual Quest 2YO H.
Secret Request. 3 wins at 1000m, 1350m in Aust. Zeventay. 4 wins from 1200m to 1600m, 2d STC Strathfield H., Auburn H., 3d STC Auburn H., Bangor H.
Battalion. 3 wins at 1400m, 1600m in Aust. Chinela. Winner at 1200m in Aust. Angel Time. Placed in Aust. SOBAR (Sobig). 6 wins-1 at 2-from 1200m to 2400m, A$119,780, VATC Caulfield Cup, Gr.1, Caulfield Guineas, Gr.1, Underwood S., Gr.1, St George S., Gr.2, VRC Blamey S., Gr.2, VATC Orrong H., 2d Victoria Derby, Gr.1, 3d VATC Caulfield S., Gr.1, VRC Craiglee S., Gr.2. Sire. TASMAN (Sir Tristram). 4 wins from 1750m to 3000m, South Australian Derby, Gr.1, MVRC Vulcan Chef H., VATC Harrie Smith H.
PLAY THE GAME (Sobig). 5 wins from 2200m to 2800m, AJC Services' Memorial Cup, L, Torch Bearers Welter H., STC George Greenwood H., AJC January H., STC Kingsgrove H., 2d STC Stayers' Cup, L, Lord Mayor's Cup, L, 3d AJC Chairman's H., Gr.3, 4th STC Stayers' Cup, L, WJ McKell Cup, L.
Tristram's Star (Sir Tristram). Placed, 2d WATC Belgravia S., L. Producer. Inter Big. 4 wins from 1700m to 2000m, Fukushima Koori Special. Sire. RAMYAH (Raami). 6 wins from 1450m to 2700m, A$301,800, South Australian Oaks, Gr.1, SAJC St Leger, Gr.3, MVRC St V's New Hospital H., VATC Orrong H., MVRC Nearco H., 2d MVRC Sportsco H., VRC Dimattina Arcadia Tomato P., 3d Queensland Oaks, Gr.1, VATC Caulfield S., Gr.1, Moonee Valley Gold Cup, Gr.2, MVRC John F Feehan S., Gr.2, SAJC Ansett Australia S., L, 4th VATC JJ Liston S., Gr.2, VRC Craiglee S., Gr.2. Producer.